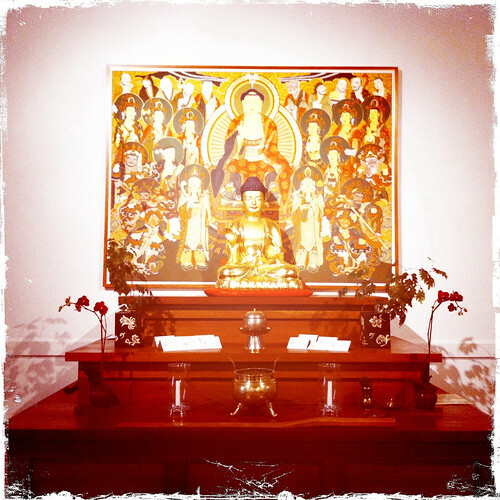 Yesterday, I attended a one day retreat at Empty Gate Zen Center in Berkeley, California. I knew it was somewhere very close by to me but had never gone looking in detail. It turns out that it is probably a mile and a half away (which, in the concentrated urbanity of the Bay Area, is further than some places but also shamefully close). Empty Gate is one of the oldest centers operated by the Kwan Um School of Zen, the Korean Zen organization founded by Zen Master Sŭngsan. The Five Mountain Sangha, in which I am ordained, is actually ultimately derived from Sŭngsan and the Kwan U School as well. Our practices and general way of doing things are very close to theirs, making it a good fit for me, potentially. Because of both this and the fact that the FMS is physically dispersed and has no regular sitting group locally, I wanted to visit Empty Gate since I would like to find someone to sit with besides my wife and/or cats. The lack of a local supportive community has been an ongoing frustration for me during the last few years. Normally, Empty Gate runs the same three day retreats, “Yong Maeng Jong Jin” (to leap like a tiger while sitting), that we do when FMS gets together for a short retreat. This month, they decided to do a shorter, 9:00 to 5:00, one day informal retreat. This struck me as both an opportunity to get a little bit of practice time in and to get to know the group and its dynamic without having to take a day off from work to spend the weekend with complete strangers (“I’m not willing to start a retreat and not finish it and what if they were not my kind of people?” says the attached mind!). It turned out to be a good choice. There were twenty two of us there yesterday, including Jason “Unknown Dharma Name” Quinn, the abbot, and Zen Master Bon Soeng (aka Jeff Kitzes). The group was much more diverse demographically than many that I’ve encountered in the past, not being a room full of either white middle-aged Zen guys or women of my mom’s generation. There were people from, at a guess, mid-20’s up into the Boomer years, and the group reflected the Berkeley mix of whites, Hispanics, and various Asian Americans (though no one black). The group was roughly half female. The center, itself, is a roughly 1,500 sq ft building, converted from something. It has a large shrine room/meditation hall, probably 30’ by 30’, a kitchen, and a couple of small rooms, one of which is used for interviews with the Zen master. It may sound like I’m focusing on minutiae here and that would be correct, in a way. When I encounter a new group or go on a retreat, the old anthropologist comes out and I tend to start counting numbers of people, gender, etc. I also look at the space, its organization and upkeep, and the way people interact, especially with the teachers or retreat masters. These things tell you as much about a group as anything that it overly said. The diverse mix that I saw, the very friendly demeanor to people and lack of cliquishness, as well as the interactions with the teachers and manner of instruction, all struck me as excellent. This is a group of people that are there to practice but aren’t so strict or bound by form that people aren’t relaxed and having fun with it. This echoes the core teachings about not making things that I mentioned the other day, but accepting the universe in all of its richness (including pain as well as joy) as it is, without preference and without creating some abstract from it within our minds. I found that this quote and Bon Soeng’s brief teaching, really set the right tone for the retreat. Of course, having not set that much in one day since August, I found myself struggling a little. My morning sitting was surprisingly strong, given how tired I had been the night before. After lunch and work period, I found myself in the place that so many of us do in retreats where I had alternate periods of strong focus and awareness and then I’d realize that I had been distracted for minutes, thinking on things, making plans. I generally remind myself that this is OK too and to be compassionate to myself, rather than turning distraction into an excuse for both more distraction and also a lack of compassion towards one’s self. It does point to the need for more regular long days of sitting and walking, like this, but it also reminds me of the advice of Namkhai Norbu and Thrangu Rinpoche (as well as others) that you’re often better to have many short but focused and solid sitting sessions than one really long one where you are distracted for most of it. I look at it almost as exercise sets and sessions. When you lift weights, do pushups, etc., you’re better off doing short, strong and well-formed sets and repeating these sets as you can than you are trying to brazen it out by doing things until your form falls apart and you can’t do anything anymore. Of course, since all of us are in a different place, it would be rather hard to structure a retreat around that. I do want to mention that Zen Master Bon Soeng and Empty Gate have taken to video streaming their Sunday morning practice periods and their Wednesday evening practice and teachings. This is the kind of thing that we are very much interested in within the Five Mountain Sangha, given how distributed we are. Empty Gate also makes very active use of Facebook and Twitter as well. I wanted to include one of the recorded Wednesday teachings by Bon Soeng to give people a low-effort taste of the style of teaching and their center. I found a recent one that also discusses the Hsin-Hsin-Ming a little bit in the context of another Zen poem as a teaching device. You can see it below (on my blog if you have Flash, at least) or also find it here. In any case, I very much enjoyed the retreat at Empty Gate and meeting people. Since they sit every morning and every evening, as well as having weekly programs, they are an excellent local resource. I’ve recommended them to at least one person who wanted something a bit more active than the simple sitting since Empty Gate incorporates prostration practice and chanting as part of the daily service, along with the meditation practice. I plan on spending more time there in the near future though I am unlikely to formally join given my role in the Five Mountain Sangha. They are an excellent group.